This is large blue-black salamander with large yellow or orange spots from the head to tail. The Spotted Salamander can grow to over 20 cm in total length, including its long tail. This species is sometimes called the Yellow-spotted Salamander. The Jefferson Complex salamanders are similar in shape and size, but they lack the large yellowish spots. 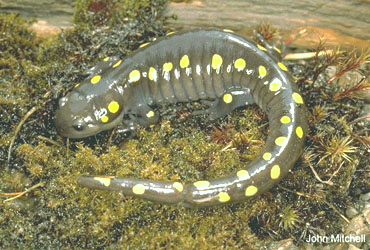 The Spotted Salamander is found throughout much of Canada east of Lake Superior. Outside of Canada, it is found across the eastern United States as far south as Louisiana. Deciduous or mixed forests and hillsides around ponds are the preferred habitat. Breeding ponds tend to be shallow and without fish. Breeding occurs in early spring, often while there is still ice on the ponds. Females lay up to 250 eggs in a mass attached to submerged vegetation. The mass quickly swells to the size and shape of a tennis ball. In one to two months the eggs hatch, at which time the larvae are just over 1 cm in total length. It takes another two to three months for the larvae to transform into salamanders 2.5-3.5 cm long. Males will take two to three years to reach maturity, while females can take three to five years. Outside of the breeding season Spotted Salamanders tend to live underground in burrows or under logs. During rainy nights they may be found foraging on the forest floor. They eat a variety of insects and other invertebrates such as worms and slugs. Spotted Salamanders can live for over 30 years in the wild. Spotted Salamanders are quite sensitive to the effects of acid rain. Acidification of ponds can prevent eggs from hatching or affect the development of larvae. There is no evidence of decline in Spotted Salamanders.